Gastrointestinal carcinoid tumors form from a certain type of neuroendocrine cell (a type of cell that is like a nerve cell and a hormone-making cell). These cells are scattered throughout the chest and abdomen but most are found in the GI tract. Neuroendocrine cells make hormones that help control digestive juices and the muscles used in moving food through the stomach and intestines. 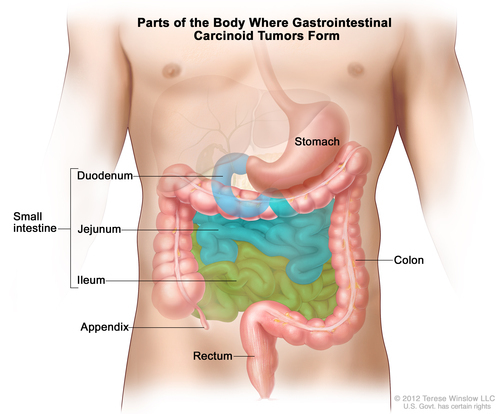 A GI carcinoid tumor may also make hormones and release them into the body.